Does the time required to read a word grow linearly with the number of characters? I recently installed a speed reader on my tablet. Now I wonder how the minimal time needed to read an $N$-letter word grows. There was this previous question on the relationship between sentence length and reading time. However, I'm particularly interested in the relationship between word length and reading specific words. 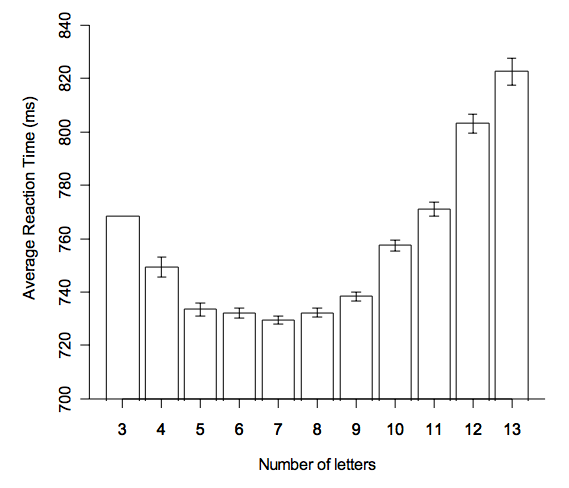 Does the time required to read an $N$-letter word grow linearly? The average response times for single words in a lexical decision task (depart real words from nonsense words) is plotted below. The curve follows a U-shape and span over several dozens of milliseconds. Figure 2. Average reaction time and 95% confidence interval for words with lengths from 3 to 13 letters if length was the only factor having an influence (all other factors have been partialled out). Does the time to recognize and understand a word increase with word length? The effect of word length has been studied for two tasks, lexical decision and naming. In a lexical decision task participants are presented with words or nonwords (e.g. "dftrpg") and have to quickly press one specific key for words, and another for nonwords, on the keyboard. The time between the presentation of the stimulus and the key press (the reaction time) is registered. Since you are reading a text in which there are no nonwords, lexical decision is irrelevant in the context of your question. Not every time a participant names a word will he or she do so in the exact same time. Sometimes someone will be a bit slower to react, sometimes a bit faster. So we calculate the average reaction time for each word. What we note is that these average reactions times are not the same for different words, that is: the reaction times vary. Now, what we want to do, is explain this variance. Is it in some way related to word length? Or does it correlate to other characteristics of the words, such as number of syllables, word type (noun, verb, adjective), word frequency (how often a word is actually used in everyday spoken language), and so on. After a number of calculations on the data, we find that all these aspects explain a part of the variance in reaction times (Baayen, Feldman & Schreuder, 2006). Here is a table of the different word characteristics (the predictors), and how much of the variance in naming speed they predict. Only those predictors are listed that had a significant effect. The numbers are adjusted R2 × 100, i.e. the percentage of variance uniquely accounted for by each predictor over and above all other predictors. You don't have to understand the meaning of these numbers, but they show the relative strength of the effect each predictor has on naming speed. The overall variance in reaction times is small. In young adults they range from around 300 to around 700 ms, with about two thirds of the RTs falling into a narrow slot of only 100 ms.
All the predictors together explain only half of the variance in reaction time (R2 = 0.4999), the rest of the variance must be attributed to unknown predictors or, more likely, are artifacts of the testing situation (distraction, boredom, etc.). The single strongest predictor of naming speed is word frequency. The contribution of each of the other single predictors is tiny (a few microseconds each). Word length predicts only a few microseconds in variance. There is a word length effect only if words are presented individually, not in a text context (Meyer, Roelofs & Levelt, 2003). To answer your question, we can say that the length of the words has probably no noticeable effect on your text reading speed. Baayen, R. H., Feldman, L. B., & Schreuder, R. (2006). Morphological influences on the recognition of monosyllabic monomorphemic words. Journal of Memory and Language, 55(2), 290-313. Balota, D. A., Cortese, M. J., Sergent-Marshall, S. D., Spieler, D. H., & Yap, M. (2004). Visual word recognition of single-syllable words. Journal of Experimental Psychology: General, 133(2), 283. Meyer, A. S., Roelofs, A., & Levelt, W. J. (2003). Word length effects in object naming: The role of a response criterion. Journal of Memory and Language, 48(1), 131-147. Not the answer you're looking for? Browse other questions tagged perception performance reading or ask your own question. How long does it take to read a sentence with X number of characters? How much additional sleep is required to recover from a given number of hours of sleep deprivation? How are humans able to read scrambled text/characters (e.g., CAPTCHA)? Does being read to improve reading speed? Do the deaf read faster? Why I read by hearing the words? Is there a limit on the rate at which incoming information can be comprehended?